Avalanches form through the interaction of snowpack, terrain, and weather, the latter being the focus of this module. The module begins with basic information about avalanches, highlighting weather's role in their development. 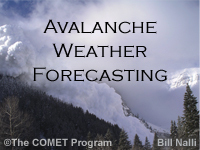 The rest of the module teaches weather forecasters how to make an avalanche weather forecast, that is, one in which key weather parameters are evaluated for their impact on avalanche potential. The forecasts are used primarily by avalanche forecasters, who integrate them with other information to determine when to issue avalanche hazard warnings. The module contains five cases that let users apply the avalanche weather forecast process to different combinations of snowpack, terrain, and weather conditions. It is a companion to the COMET module "Snowpack and Its Assessment," which describes snowpack development and various assessment techniques. This lesson is good for clearing out the summer cobwebs or could be coupled with hands on and classroom learning to introduce topics. Last two questions are worded unclearly. This lesson is a really nice introduction to all things avalanche. If you're even vaguely interested, I'd recommend this module. If you plan on being in avalanche terrain, the information here is vital. This is on the job training, as well as educational accredation. Very awesome section. Info was based on cases and real life examples. Enjoyed it very much. Well organized. 5 challenging case studies with detailed answers and reasoning. Easy to navigate through short sections of data creating manageable chunks of learning. Excellent course for anyone trying to bridge the gap between avalanche forecasting and weather forecasting. Highly recommended for avalanche professionals trying to increase their knowledge of mountain weather AND meteorologists wanting to increase their understanding of avalanche science and the info required to forecast avalanches. Nice, easy to understand and informative.